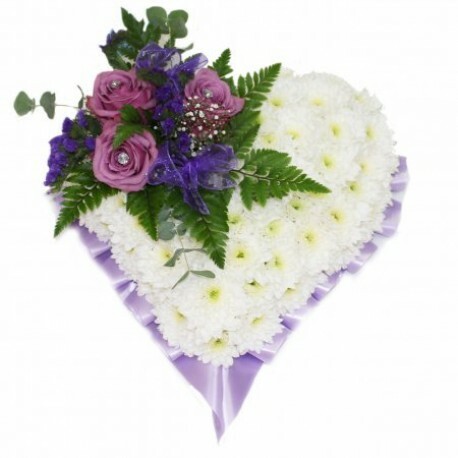 This heart tribute has been trimmed with lilac ribbon, based in chrysanthemums and a contrasting clusters of flowers is displayed on the top corner. The colour of the trim and cluster can be altered to suit your requirements, please notify us of can changed to colour when ordering. If you require further advise, please call Flowerscene on 01224 712596. This tribute is suitable for a funeral or for rememberance. Flowerscene deliver flowers in Aberdeen and surrounding areas.